In an age when scandal can destroy a company's brand or anyone's reputation in an instant-GLASS JAW is an Art of War guide to modern crisis management. In boxing terms, a tough-looking fighter who can't take a punch is said to have a "glass jaw," and so it is these days with targets of controversy. Down the rabbit hole of scandal, the weak are strong and the strong are weak. Just consider this slate of recent reputational body blows: Toyota, Susan G. Komen, Paula Deen, Tiger Woods, Joe Paterno, BP, the Duke Lacrosse players, Lance Armstrong, and Anthony Weiner. 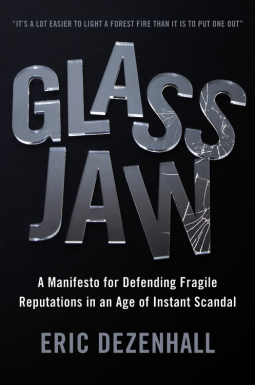 GLASS JAW is a manifesto for these times, written by crisis management veteran Eric Dezenhall, who has spent three decades dealing with some of the most intense controversies, both known and . . . handled with discretion. How there really is no "getting ahead" of a bad story (and other clichés from the media)The perils of navigating the "Fiasco Vortex"The art (and transaction) of the public apologyWhy a crisis is not an opportunityThe Nixon Fallacy: if only he had just said "I screwed up," the whole thing would have gone away (not a chance)How you are the enemy: the self-sabotage of selfies, tweets, emailing before thinking, technology creep, the privacy vacuum, and the industrialization of leaking. From the boardroom to the parenting messaging board, scandals erupt every day. GLASS JAW explains this changing nature of controversy and offers readers counterpunches to best protect themselves.